Russia’s first post-Soviet large domestic airliner, MC-21-300, has received two of the first 16 domestically-made engines to eventually replace American Pratt & Whitney engines that it currently uses. The Irkut Division of Russia’s state-run United Aircraft Corporation (UAC), which is in charge of the MC-21-300 airliner project, will reportedly receive the next two PD-14 engines developed by Russia’s Aviadvigatel in the Ural city of Perm within the current year. So far, the domestically-produced turbofan engine has undergone an audit by the European Aviation Safety Agency (EASA). The manufacturer expects the agency to grant approval for operating jets equipped with PD-14s by the end of the year. This will allow foreign air carriers to buy MC-21-300s powered by Russian engines. The maiden flight of the Irkut MC-21-300 took place in May 2017. It is scheduled to make its public debut at the Moscow International Aviation and Space Salon (MAKS 2019) later this year. The Russian-made narrow-body airliner, which is set to complete certification tests by 2020, is expected to challenge medium-haul jets such as Airbus A320neo, Chinese Comac C919, and the troubled Boeing 737 Max. The main competitive advantages of the jet include modest operating costs, which are up to seven percent lower than its competitors. The jet will replace the remaining Soviet-era Yakovlev Yak-42, Tupolev Tu-134, Tupolev Tu-154, and Tupolev Tu-204/214 airliners. Community Tourism island wide, will receive a major boost following the commitment of approximately J$300 million by Minister of Tourism, Hon. Edmund Bartlett. The money will be disbursed to sixty three (63) communities across the country to have small events and activities to attract more visitors, and increase potential earnings of small tourism suppliers. “The building out of more tourism products under our Linkages Network, forms part of our overall growth strategy to attract more visitors by adding value and enhancing their experiences. Adding value has become a benchmark in the highly competitive tourism industry and when you are able to give more you will have a better value proposition for visitors than your competitors. These community tourism projects will provide authentic Jamaican experiences, whether it be food or entertainment, for our visitors and increase earnings for our suppliers,” said Minister Bartlett. 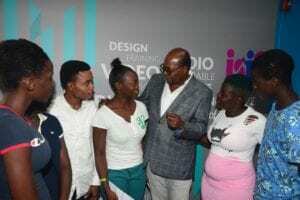 Minister of Tourism, Hon Edmund Bartlett (2nd R) engaged a batch of the first cohort of students to be trained at the M-Academy. M-Academy, which was launched today in Kingston, is a Jamaica Social Investment Fund and Main Events partnership providing alternative Livelihood and Skills Development. The announcement was made today during the official launch of M-Academy at the Chinese Benevolent Centre in Kingston. M-Academy is a Jamaica Social Investment Fund and Main Events partnership that will provide alternative Livelihood and Skills Development. The main objective of the initiative is to provide demand driven skills in event production to 100 students from 7 parishes across Jamaica. In endorsing the move, Minister Bartlett added that, “I am pleased that this initiative will help build the capacity of our young people who will in turn be able to earn and meet the demands in the entertainment sector, which is inextricably linked to tourism. The M-Academy training program will initially certify 100 at risk youth in various aspects of world class event management and production skills by one of the leading entertainment companies in the Caribbean.